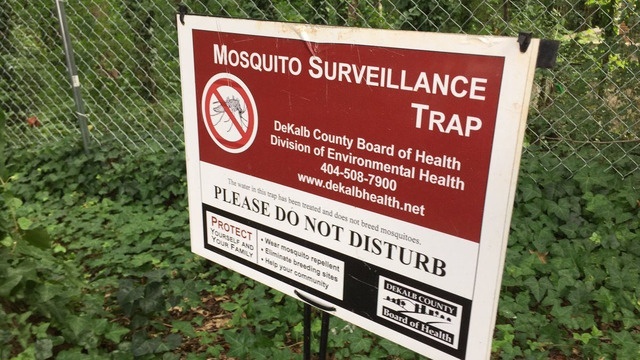 DECATUR, Ga. – The DeKalb County Board of Health has trapped West Nile virus-positive mosquitoes in the southeast portion of the City of Tucker. The Board of Health is educating the public on how to eliminate mosquito breeding sites and protect against bites. Door-to-door visits are being made in the identified area. To date this year, no human cases of West Nile virus infection have been confirmed in DeKalb County. To reduce the spread of West Nile virus and other mosquito-borne diseases, the Board of Health conducts a comprehensive mosquito control program. Throughout the county, technicians routinely trap mosquitoes that are tested for viruses. They also work with residents to eliminate infestations. Measures include placing larvicide in areas with standing water, like in storm drains. This keeps young mosquitoes from becoming flying, biting adults. • Reduce mosquito breeding in your yard by eliminating standing water in gutters and items such as planters, toys, wheelbarrows and old tires. • Discourage mosquitoes from resting in your yard by trimming tall grass, weeds and vines. • Reduce outdoor exposure at dawn and dusk, when the mosquitoes that transmit West Nile virus are most active. • Wear a long-sleeved shirt, long pants and socks when outdoors, particularly at dawn and dusk and in areas with large numbers of mosquitoes. • Make sure window and door screens fit tightly to keep out mosquitoes. • Use an insect repellent containing DEET, picaridin, oil of lemon eucalyptus or IR3535. Apply according to label instructions. • Spray clothing with products containing permethrin according to label instructions.